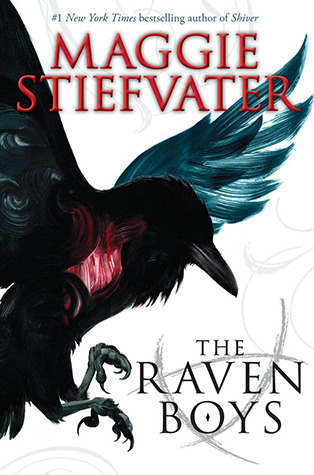 I’m so excited to share Maggie Stiefvater's THE RAVEN BOYS with you. As those of you who’ve been following me know, I’m a HUGE fan of Maggie Stiefvater. I found her first book, LAMENT, THE FAERIE QUEEN’S DECEPTION, at the library in 2008 and have been a fan ever since. A highlight of my life was meeting Maggie at a book signing two years ago. This is one of my favorite books by Maggie. I LOVED it! I was immediately sucked into the story in the first few pages learning that Blue’s psychic family has predicted that if Blue kisses her true love, he’d die. So she vows never to fall in love. How can you not be sucked into that? She’s the only one in her family who isn’t psychic, but her presence increases their powers. Then when she goes with her mom’s mysterious half-sister Neeve to record the-soon-to-be dead, for the first time she sees a boy named Gansey who speaks to her. And you can see in the above blurb what Neeve tells her that means. Of course, Blue meets Gansey and his faithful friends Adam, Ronan, and Noah. Gansey’s mission is to find the ley lines that Henrietta, Virginia is situated on. He hopes it will help him discover where a mysterious Welsh king is buried and to unlock the king’s secrets. It’s fascinating watching their search for the ley lines and seeing the magical world they discover. Maggie has created such an interesting world of everyday Henrietta, where Blue lives, the private boarding school of Aglionby where Gansey, Ronan, and Noah live and Adam goes to school, and this hidden world they discover. I couldn’t turn the pages quickly enough to see where their quest would take them. Not only has Maggie created an amazing hidden world and search for the ley lines, but she’s also created the most interesting, memorable characters. Blue lives with her psychic mother and her mom’s psychic friends Persephone and Calla. Then her mom’s mysterious half-sister Neeve comes to stay. The family dynamics are so interesting. Blue is an independent teen who doesn’t take crap from anyone. And you can’t help sympathizing with her plight of never being able to fall in love and worrying that she’ll somehow cause Gansey’s death. Gansey is a rich boy who has everything and could just be a party boy. Instead, he cares deeply for his friends, Adam, Ronan, and Noah, and does what he can to help them. And he’s obsessed with finding the ley lines and the body of the Welsh king. You’ll have to read the story to find out why. Adam, Ronan, and Noah are equally compelling in their own ways. They all have back stories that totally connect with the plot and why they embark on the dangerous quest with Gansey. Blue’s relationship with Gansey and his friends develops very naturally from not wanting to have anything to do with them to a deepening friendship. Maggie does a really good job of the little love triangle relationship between Blue, Gansey, and Adam. I’m not usually a fan of love triangles, but this one is done perfectly. There’s a lot of narration here, which would normally slow down the story for me. But not here. The fantastic plot, the desire to learn about the ley lines, the Welsh king, the world Blue and her friends discover, and the totally fascinating characters kept the pages flying. I consumed this in two days. I so recommend that you read this book. And I’m super excited that this is a four book series. I can’t wait to read more. I'm giving away my ARC because I want to share this awesome book with you. To enter, all you need to do is be a follower (just click the follow button if you’re not a follower) and leave a comment by midnight on October 27th. I’ll announce the winner on October 29th. If your e-mail is not on Blogger, please list it in your comment. International entries are welcome. And don't forget to enter my contests for CREWEL, THE TORN WING and ASHEN WINTER, three awesome books. The links to the contests are at the top of the blog. On Friday I'll be sharing a guest post by debut author Jordan Jacobs and giving away a copy of his middle grade book, SAMANTHA SUTTON AND THE LABYRINTH OF LIES. It's a story about a legendary ghost, a hidden treasure, and a ancient temple in Peru. Next Monday, I'm interviewing debut author Shelby Bach and giving away a copy of OF GIANTS AND ICE. It's a unique fairy tale retelling centering around the Ever After School. It's a story I really enjoyed and I think you will too. Love the sound of this book. I'm so in, and I'm already a follower. Thanks for this awesome giveaway! Already a follower! I have to say, I didn't particularly like the Mercy Falls trilogy, but this looks and sounds like something I might want to read! Thanks for the review! You've totally sold me! Adding to my TBR list now. I've been hearing tons of good things about this book, so I really can't wait for it! Maggie's books are so highly regarded, the stories are all so rich. Thanks for sharing your review. Lots of good interviews coming up, too! I've been really excited to read this book! It sounds amazing. I'm already a follower. Definitely enter me in the drawing! I loved this book, too! It wasn't as lyrical as her SHIVER series, nor was it as deeply characterized as SCORPIO RACES, but it really hit that sweet spot of unusual myth. Plus I'm a sucker for Welsh history and legends and magic in general, and I loved how she wove it all together and brought it into the new world. (Also, I adored Gansey.) Can't wait for the sequel! Thanks so much for sharing your brilliant reviews, Natalie! I was completely shocked how much I loved this book! I just started this one the other day, and it's already really good. Blue's quirky family is hilarious, and so far I really like the writing style. I haven't read any of her other books, but I might have to, now. Thanks for the review! I will most definitely have to come back for all the good stuff you've got planned and after reading your review and the blurb for The Raven Boys, I definitely want to win that, too! This book sounds super cool. Thanks Natalie for introducing me to this great book. "Next Monday, I'm interviewing debut author Shelby Bach and giving away a copy of OF GIANTS AND ICE. It's a unique fairy tale retelling centering around the Ever After School. It's a story I really enjoyed and I think you will too." I haven't gotten around to reading this book yet, but I've heard so many good things about it. Thanks for your careful note of the romance and Blue's situation, family and romance-wise. Characters and world-buliding are two important elements to me when reading a book, and I'm glad to hear that it's so well done. I can't wait to read this one! Terrific review, Natalie. Please enter me in the drawing to win THe Raven Boys. I loved the Shiver trilogy of Maggie's and am anxious to delve into this new one. Really enjoyed Scorpio Races and this one sounds interesting, too! Sign me up! Love Maggie's books and this one sounds like it will be fabulous as well! Great review! I've been dying to read this book. Okay, I'm definitely intrigued by the description! Sounds great! And what a great set of posts you have coming up. Can't wait to read them. Sounds like a great book, but alas, I still have three of her other ones I've yet to read. One I won. One I bought for my son (he got bored and gave up on it). And one for a series I was following, but I have had a chance to read it. This does sound like such a cool book! I met her once and she is pretty cool! Heard lots of great things. This is one I'm going to have to check out. Thanks for the heads up, Natalie! Sounds like this novel has a level of depth that would be easy to slip into and wrap one's self in. Great review, Natalie. Great review!!! Maggie's one of my all time favorite story tellers. Sounds like a special book. It's inspiring when you meet those whose work you admire. Thanks for this giveaway! I've been wanting to read this book! I've been hearing wonderful things about this book. The cover looks wonderful and great review. I also tweeted. Can't wait to read the one. The Scorpio Races was one of my favorite reads this year. small voice: i haven't read anything by Maggie Stiefvater. Sounds as if I should. Thanks for the giveaway. Yes please! Just finished The Scorpio Races and loved it, and this one sounds so different and intriguing! Maggie Stiefvater is brilliant! Thsi book is already on my tbr pile! Thank you for giving away a copy! I feel like the last person alive to read one of Maggie's books. I'm hoping to start with this one and work my way through the rest. I hear she is absolutely amazing. Thank you for the opportunity to win this! I've been really looking forward to this one! I have a friend who just started reading it and she likes it so far. I want to enter, please. I have blogged about this! I'm so excited to read this one. I loved The Scorpio Races. I love Maggie Stiefvater! I hope I win! My e-mail is meganclements4@yahoo.com.